From this video, it appears that material is being flung outward from the limb of the Sun at pretty high speed. Considering that the Sun is some 1.4 million km in diameter, and at least one band seems to cover the distance of perhaps a quarter of the Sun's diameter in about a second, that's on the order of 300,000 km/sec or the speed of light. Is that right? Is the video sped up? If sped up, by how much? If shown at actual speed, is the expanding band actually material moving, or is it just electromagnetic field lines? The video is significantly sped up (videos of the Sun generally are sped up). CMEs move at an average speed closer to 500 km/s. That's why when we see the activity we generally have a warning of up to a few days before the CME gets to where we are. If the CME was moving at the speed of light, it would hit us as we saw it happen (a little more than eight minutes after it actually leaves the Sun). The band that you're seeing is called a prominence (or filament*), and it is material moving through an area of the magnetic field. When they burst, such as in the image below (Thank you, TildalWave), you can get a CME. This image has a timestamp so you can see exactly how long it took in this one. 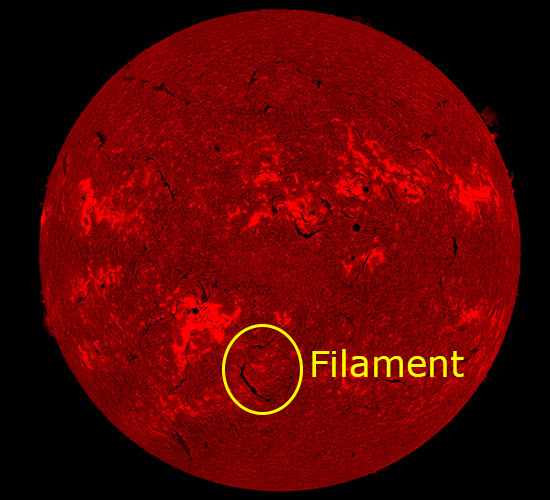 * Whether it's called a prominence or filament depends on your perspective. A prominence is when you see it from the angle in your video. It would be called a filament if you were looking at it straight on and couldn't see the actual arch. It would appear as a dark line on the surface. Edit: An article at NASA.gov (Thank you, briligg) talks about a solar storm event in 2005 that reached the Earth after only about thirty minutes following the flare. This wasn't exactly a CME, but a different kind of solar storm. Not the answer you're looking for? Browse other questions tagged observation the-sun cme solar-dynamic-observatory space-weather or ask your own question. Why do coronal mass ejections happen on the Sun? Can they affect artificial satellites? How do solar flares and coronal mass ejections create proton storms? How do solar flares degrade orbits? Is a coronal mass ejection (CME) synonymous with a solar particle event (SPE)? What's the rationale behind the false colours in solar observation photographs? How can a solar storm be predicted?